I had a close encounter of the book kind the other day. UBC Security was selling off all the unclaimed lost and found stuff and I saw this old book in the pile. I picked it up and it was a 1908 copy of Tennyson’s poems and it had a sticker inside saying it was the property of such-and-such all-girls school (I LOVE those personal elements). My heart raced and I was filled with longing. I drew a sharp inhale of breath…oh, he has NO idea. I fumbled with my purse and heard coins (oh thank God, I have money! ), but then counted only 2 nickels. Oh NO! I set down the book (obviously not thinking straight in my passion) and rushed to the ATM, then rushed to break the $20 bill (I didn’t want to make those security guards irritated about breaking a 20 for a measly 50 cents after all), and rushed back. The book was in another woman’s hands. I screamed at her internally: “SET IT DOWN!” and she did. In slow motion I leaned–leaned–leaned towards the book, but an old hand snatched it up before my fingers touched. An elderly lady gave the security guard $1 for the book and turned away. In a matter of moments, my dream had died. I walked to my on-campus job, feeling dejected. I was early and so I meandered the halls of the AnSo building, when I heard my boss’s cheerful voice calling me. “Hi.” I said, rather downtrodden. “What’s the matter? !” she asked, concerned. I told her the story in all its glorious sadness. “I want to make up for it. It’s so sad. What can we do? Let’s pick a book off of my shelves.” She said. “That would be good,” I said with sadness. “Oh here’s one on archaeology…(sigh)…but, I really kind of want to read this one…” Patricia said. 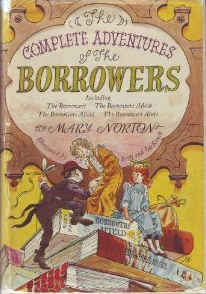 “It’s okay Patricia, archaeology isn’t really my first choice.””What about ‘The Complete Adventures of the Borrowers’?” “YES, THAT IS THE ONE! THAT IS MY FIRST CHOICE!” She handed it to me and it was beautiful. Four books in one volume. The same exact copy I read as a kid. No newfangled illustrations. It was perfect. I was happy again.